Recently there has been something happening in my life that has caused a shift, in the best of ways. I will be sharing it soon! Until then I want to talk about one of my best friends, Critley King. Critley and I met in college in the Theatre department. Now that we’re both graduated we love chit chatting, double dating, and most importantly, shooting each other creative ideas over a cup of coffee for hours. Much like my love for blogging, Critley and her fiance, Scott, have a really great vlog going for them. Yes, these are costumes. We don’t normally dress like this. KS Vlogs is a “real reality” vlog show, that Critley and Scott update regularly. I talk to her almost every day but I still love watching her videos about what’s going on in their day to day. Recently Critley and Scott have announced that they are doing a year long book club: the 50 State in 52 Weeks Challenge. This contest entails reading a book that takes place in a different state every week this year. Now, I’m very realistic and I don’t think this will be possible for me to accomplish every week, but I have decided that when I can I’m going to hop on the bandwagon and join in! This week’s state that the book needed to take place at was Louisiana. Thank goodness for Good Reads. Recently I have revisited my Good Reads account, which until now has been full of textbooks. Go figure. Did you know you can search for books that take place in different states on the website? It will be a life saver for this book club. After scrolling around for a little while, I settled on a book that had a title that intrigued me: A Lesson Before Dying. Here is my review about the book! Don’t worry I don’t spoil any of the plot. 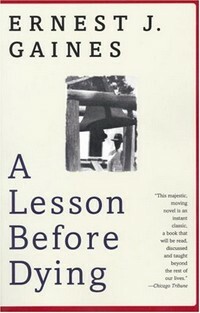 A Lesson before Dying, by Ernest J. Gaines, is set in a small rural Louisiana in the 1940’s where a teacher, Grant, feels as if he is running in place. Desperate to escape the small town he is stuck in, Grant is especially exasperated when his aunt and her best friend, Miss Emma, asks him for an unusual favor. Miss Emma’s godson, Jefferson, is recently found guilty for robbery and murder, and is sentenced to death row. Miss Emma is determined that Jefferson deserves to die as a man, instead of an uneducated animal the trial had painted him out to be. This favor involves weekly jail visits to help a man, devoid of hope, to accomplish this. Much like any book where there is a trial, this novel was a journey. I felt like I really followed Grant and Jefferson throughout the book. It really was an emotional roller coaster. In fact, in my opinion the experience of reading this book was probably better than the book itself. I liked the dialect, the writing style, and the Southern, hazy atmosphere Gaines’ set up, but I felt like there was something that was missing. I have to admit that over all I did not like the book. I will not spoil too much of the book, but I will say that this was one of the first novels whose narrator I did not like in the slightest. I found Grant hypocritical, selfish, and a huge jerk throughout the entire story. Perhaps a large turn off for me was the way he taught his students (very militantly, but standard in the 40’s), but just when I hoped for a redeeming quality to save him from my scorn, he would then do, say, or think something else that made me even more skeptical of his character. If that was Gaines’ intent, then he did a wonderful job. I thought I might fall in love with his aunt or Miss Emma. I could imagine two sweet old best friends trying to persevere through a hard time. I knew they would have the morals and wisdom Grant did not have. However, since it was told through the eyes of Grant throughout most of the novel, the reader only received looks of anger and disappointment towards the narrator from the two old ladies…and from almost every other character as well. Oh Grant…what a mess up. My biggest complaint was the fact that I thought I would see more character progression as I read. As I went through the book I kept waiting and waiting, until finally towards the end I found a little evidence of character growth from the second protagonist, Jefferson. As for the main protagonist, by the end of the book I was still left questioning if Grant had really gained anything but a smidge of an emotional response that didn’t revolve around himself. Yay. I was also left feeling unsatisfied by some point of view shifts at the end of the book. Almost the entire book is set from this one person’s perspective, but in the last several chapters Gaines switched the narration and focus, perhaps to get a broader view of how the story was actually affecting the small community it was taking place at. I think I understood what Gaines was trying to accomplish in this, but a large part of me just wished that there had been more consistency. I would have much rather wanted to read a peppering of third person accounts throughout the entire book, rather than at the end of the novel, especially since the third person accounts introduced insignificant characters. By that point I just wanted to find out what was going to happen with the character I had been following, not about what some random woman walking down the street was saying! I was not blind to the really valuable parts of the book: the change in Jefferson, the significance of his transformation in the eyes of society, Grant standing up for his education (despite many white people being against it), the white prison guard that truly cared about Jefferson. There was one particular interaction between Grant and Jefferson that I really appreciated (I will quote below). I just couldn’t avoid rating this book without my dislike of the characters and their loose ends not being resolved by the end. Plus I was really sensitive to the racist culture the book was set in. Plus I didn’t get enough old lady righteousness. Plus Grant, I mean how could you leave your whole school in control of a sixth grader…frequently!? Okay, that may be a little too revealing to the book. That’s why I gave this book a 3/5 on my Good Reads page. If Gaines wanted me to dislike Grant well he did an excellent job. Maybe a 3.5/5 instead if that’s the case. I know that this book has recieved a lot of praise and wonderful ratings, but perhaps it just was not my cup of tea. That is my review and my opinion on the book, take it or leave it. I would, however, recommend it to anyone just for the sake of reading it and the experience it leaves you. I am excited to get my hands onto a book for next week’s state. To find out what it is pleased check out KS Vlogs here by tonight! To join in all you have to do is comment on her videos what book you read, or you can comment on my posts as well! Also to follow my Good Reads experience, click here!